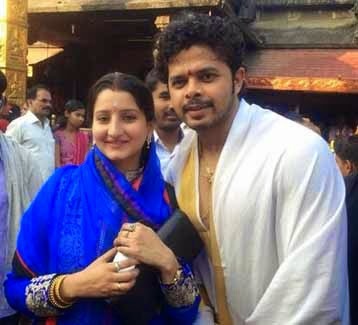 Mumbai : Former cricketer S.Sreesanth is all set to make his Bollywood debut in the comedy-suspense movie “Wo Kaun Thi.” The latest about S.Sreesanth that, He is all set to become a proud father also. According to sources, Sreesanth's wife Bhuvaneswari is pregnant and the couple is expecting their first baby. We hear, Sreesanth is excited and it is a celebration time for him. While the film 'Wo Kaun Thi', that is Produced by Naresh Patel under his banner Kinjal Film productions Pvt Ltd. The film is directed by Aditya Atul and written by Hitesh Rathod. Madhu Balakrishna, Palak Muchchal and Bhumi Trivedi also sang different songs for this same film. Siddharth Shrivastav is the music director of the film.S Sreesanth told media that he is playing Gujrati guy in the film. He is also singing rap song in the film which will go on floor in first week of April.